They arrived in chariots called rickshaws. In my earliest adolescent memories, the chariot always came late at night, its deep grumbling engine crumbling the dark silences. And then the sudden quiet as the engine was turned off, hands banging-clanging on our metal gate, the doorbell trilling nonstop, the coughs and footsteps of either the live-in driver or the cook passing underneath my bedroom window as he hurried down the driveway to unlock the padlock on the gate, my father rising to unlock the main entrance, my house suddenly alight with life as my mother and maternal grandparents scrambled downstairs, sleep still simmering in their eyes, and then loud shrieks in Kashmiri: “Keri chu? Vari chu? Ahnaz, Ahnaz? How are you? How’s everything? Fine, fine.” I would bounce out of bed and bound down the stairs and there they were, my Khalas, my mother’s sisters, having arrived, unannounced, from this magic kingdom called Kashmir. In the living room, the gas heater leapt to a blue flame-orange ember enchantment over the revellers, all talking at the same time, louder and louder, elation filling our house like excited children in a schoolyard, and yet everyone caught what everyone was saying and there was so much laughter, too much laughter. “Stop laughing, stop laughing, for fear of the evil eye,” Moji, my grandmother, cautioned, but although all three sisters were prone to superstition, at this time they would calm down only for a moment before starting up again. I watched my Khalas peel off their beige bobby socks and wiggle their winter-cold toes before the heater, and my mother, a fount of sudden serenity, sandwich herself between them, and my grandfather, Abaji, beam even as Moji handed him his heart medicine, which he put under his tongue lest this unexpected arrival of his daughters be too much to bear. “Tea? Biscoots? Kebabs? Samosas?” The cook entered, his pale blue eyes twinkling, for he knew the arrival of my Khalas meant fat tips at the end of every good meal served and every errand run. I sat on the winding staircase that led from the living room to upstairs, savouring the sizzle and scent of cocktail samosas and homemade shami kebabs frying in Kashmir Banaspati Oil—because in Pakistan, adding ‘Kashmir’ to every venture is considered good luck—emanating from the kitchen and mingling with the tales of my Khalas’ journey—a flight from Srinagar to Delhi and from there either a train ride into the Lahore Railway Station, or, from Delhi to Amritsar and from there via foot through the Attari-Wagah border-crossing which connected Amritsar and Lahore. Attari. Wagah. Amritsar. To me these places sounded like fairylands children travelled to on flying carpets. Tomorrow, my Khalas would have to report to the police station, as would all Indians visiting Pakistan, as would all Pakistanis visiting India, and though this was a mild inconvenience for them, for me a trip to the police station was always an adventure: portly policemen with pert moustaches, jotting down names and dates in obese rosters, smoke from their cigarettes clouding the sign above their heads: No Smoking. For the duration of my Khalas’ visit—never less than three months, and once even six months long—my home became a warm, fuzzy, true love spell. My mother craved her sisters. That she was the baby of the family was a strange concept, yet it was stranger still to see her transform into a little girl with them, pouting to get her way, cajoling them into making her favourite delicacies, hunching between them as if they were her shelter in the world, her voice taking on a little girl’s hue, like a little sister who expected to be pampered and indulged, and was. My mother became almost cute. Apart from Aunty Tahira and Aunty Haseena, elder to my mother by over a decade, there was another sister too, Aunty Mahira, who lived across the road from us. My mother dialled the phone to call her: They have come. I remember all four sisters together as if they were a still life painting. Tahira, Haseena, Mahira, Naheed. The eldest, Aunty Tahira, was a hummingbird, her fragile features and delicate rosebud mouth resembling Moji’s, although her ivory complexion and blue-green-grey eyes were Abaji’s. Aunty Haseena had Moji’s black eyes and jet-black hair, but like Abaji, she was tall and regal with a prominent, aquiline nose. In her younger days she had been compared to the film star Nutan, and the superstar actor Raj Kapoor had even offered her a film role. Aunty Mahira had her own uniquely pretty button features surrounded by masses of frizzy, curly, wild hair no one knew had come from where or how to tame. My mother was a beautiful mixture of Aunty Haseena and Abaji. My Khalas came laden with gifts from Kashmir: pashmina shawls, beige and navy and purples and pinks with vines of embroidery climbing up the edges, unshelled almonds and walnuts plucked straight from their gardens, and fresh Kashmiri tea leaves that looked like any old tea leaves, but, when brewed, dyed the water, milk, and cream with a pink so deep and pretty it seemed a sin to drink it. During their visits, Abaji always decided it was his job to make Kashmiri pink tea—noona chai, salt tea, because instead of sugar it is flavoured with salt. The cook watched wide-eyed as Abaji, who otherwise certainly did not enter the kitchen to cook, stood at the stove stirring the concoction for hours. I too was riveted as Abaji boiled the tea leaves, stirred in the milk and the cream, added the salt and a pinch of bicarbonate-of-soda to coax out the pink, adding a little more of this, a little more of that, until he finally garnished the tea with ground pistachios and almonds which he’d blanched and slivered himself, for when it came to noona chai, he trusted no one. I can still hear Abaji scoff at the sorry version of pink tea often served at Pakistani weddings—an oily, watery, beigish-pinkish tea which was seasoned with, of all horrors, sugar. When Abaji’s tea was prepared, the cook served the pink delight in turquoise teacups and Abaji would watch his family sipping and crumbling savoury pastries such as bakirkhanis or qulchas into it, his face etched with deep satisfaction, as if he was back in his beloved Kashmir. He wasn’t. But no matter, his daughters surrounded him, their children were healthy, their marriages were fine. Life could not get any better. Abaji coloured every morning with a ritual no matter where we lived: England, Saudi Arabia, Pakistan—he bathed and then in his white vest and towel-lungi, he sat on the prayer mat to repeat one of God’s ninety-nine names for at least an hour. His chanting sounded like he was gargling his soul and I said as much once and got into a lot of trouble for talking about religion in this way. Moji defended me. She always defended me irrespective of whether I was right or wrong. Routines were the same, yet life changed with my Khalas’ arrival. Now, when Abaji chanted the daily early morning prayer, my Khalas joined him, hot cups of tea waiting for them all once they finished. When my mother ate her breakfast of tea, sliced apple, papaya, and oatmeal, my Khalas ate with her and bid her farewell when she, an anaesthesiologist, left for the hospital, and a little later, they would do the same for my father. When my grandparents came downstairs, they’d order another round of tea and all of them would sit and read the Quran first, followed by the Urdu newspapers—religion and state, I observed early, both came in ink and lived on paper, though the contents of one were supposedly indisputable and that of the other always open to dispute. The rustle of newspapers, the shur-shur-shur sound their mouths made as they read under their breaths, the way they shared their reading glasses, as if their eyes were one and the same, the ticking of the small grandfather clock behind the sofa that was ‘Abaji’s chair’, the morning sunshine pouring in from the wall of windows, bathing them in pale fronds, all came to signify for me a deep sense of ‘home’. “Baji?” The cook would come in to inquire about lunch and dinner. That my mother had already purchased groceries for the entire week and that my Khalas had merely to tell the cook what to prepare—chicken or mutton, eggplant or cauliflower, yellow daal or black daal and always, always white rice because without white rice a meal for Kashmiris is incomplete—did not stop my Khalas from frequenting Ghalib Market, the crescent-shaped bazaar close to our house, on the pretext of buying groceries. They needed only the smallest of excuses to pull on their flat sandals, wrap shawls over their plump shoulders, cover their heads with dupattas, and set off for the bazaar. Sometimes they went several times a day to browse through the vegetable and fruit stalls, the fabric stores, or to check out the buttons, laces, and embroidery at the haberdashers. During vacations or after school, I tagged along, a rare treat to walk that short, potholed distance rather than merely observe it from the confines of an air-conditioned car. In the winters we plodded through air a-sizzle with cart vendors roasting corn on the cob or sweet potatoes with their white flesh sprinkled with spices and orange juice, and, in the summers, we waded through a soup of humidity and dust and heat boiling with the stench of roadside garbage heaps and the buzz of mosquitoes. Abaji often accompanied us, and all their voices boomed over the honking horns and hawkers’ calls. My Khalas bargained in their Kashmiri accented Urdu, their mispronunciations, their incorrect grammar, their oddly-worded phrases in no way diminishing their celebrity status: they were from Kashmir, Indian-administered Kashmir. Every shop showered us with warmth and plied us with soft drinks and biscuits, a courtesy my Khalas returned by usually purchasing a little something. And, on the walk back, they would chuckle over their celebrity status even as they lamented over their lighter wallets. My Khalas’ arrival also meant that Kashmiri would become the lingua franca of our house, and my Urdu-speaking father, who could understand little, would sit in the midst of them all, unfazed. I could understand it fairly fluently and Kashmiri often struck my childhood ears as funny, the strange, guttural sounds of words like ‘gagur’, meaning rat, and ‘cockur’, meaning chicken, doubling me over with mirth. But Kashmiri was also a complex language in which a single word had several meanings depending on the inflections. So for instance, ‘soont’ could mean either apple or fart with just a slight variation of the way the ‘soo’ was pronounced. It was a language that kept me on my toes, for my mother liked to play inflection games and she would rattle off, ‘tshoot, tshoot, tshoot’, and my untrained ear would stretch to hear ‘bread, short, garbage’. Kashmiri was simply my mother’s tongue, the language in which she scolded and cursed, the language in which she hummed melodies such as the love song “kaathu chook noondabanay, valo mashauk a meyanay, where are you my love, come to me . . .” the language in which she was so much at home. Kashmiri was a bridge between my mother and me, the language of games, of love, of laughter, a secret language even, the full benefit emerging when my Khalas were in town. In the chilly months, the four sisters sat before blazing heaters, an old newspaper spread between them as they peeled chestnuts, or, in the hot months, lolled under ceiling fans and air-conditioners as they sucked on the ruby flesh of ice-cold watermelons, hendthwendths—another Kashmiri word I found so very funny—and chattered away in the safety of each other. Chatter inevitably turned into gossip. The sisters would lower their voices even though Abaji would be napping in his chair and my oblivious father would be reading his newspaper, and there I would be, tucked into a sofa or perched silent and still on the winding staircase, as good as invisible to them, the keen, hungry ears of my childhood devouring everything: scandal, adultery, fraud, embezzlement, raunchy jokes, abandonment, love affairs, runaway daughters and useless sons, and, of particular interest to me, children who had aced their exams versus those who had altogether failed to accrue any distinction and had thus broken their mother’s dreams and hearts. Little did I realise then that this language would come to give me a semblance of ‘home’, no matter that I could not speak it. But it was a bridge and in that vein I remember one incident during one visit to India. My mother and I were at the Kashmiri handicrafts shop in Janpath Hotel in New Delhi, the retailers advising each other, in Kashmiri, to quote “these tourists from Pakistan” an inflated price, when my mother replied to them: “Beh theh ches Kehshir, I am also Kashmiri.” Suddenly, the price fell dramatically and out came complimentary samosas and soft drinks. They too had recognised ‘home’ and a ‘bridge’ in a stranger’s tongue. Bridges-to-homelands and so many evenings, other Kashmiris would visit my Khalas, eager to hear the news from what used to be their or their ancestors’ homeland. I witnessed tears in Abaji’s eyes during these get-togethers, for he had not been to Kashmir for a long while. I don’t think when he’d left Kashmir as a young man, he’d ever thought he would be at the mercy of visa officers with borders and partitions in their minds and hearts. The tale goes something like this: A long time ago, a time before birth certificates, birthday parties, and birthday cakes, Rabea Bazzaz and Mehraj ud din Pandit were born to their respective families. They grew up as all children in that land did: Mehraj went to school and played outdoor games and Rabea did not go to school and played indoor games. Rabea and Mehraj were betrothed at a very young age and when Rabea became a woman at around thirteen, she was married to the probably sixteen-year-old Mehraj, and so it was that the young woman left her father’s home for her husband’s. While Mehraj continued to attend school and play outdoors, Rabea navigated her way around her in-laws’ house, and in her free time, cradled her dolls. Soon, Mehraj and Rabea were blessed with a daughter, a child Rabea discovered was a living doll and playmate. In all, the couple would go on to have six living children, four daughters and two sons—one of the sons, despite Rabea’s wishes, would be adopted by childless relatives, as was often done in those days. While Rabea was occupied with rearing her children, Mehraj completed his education, eventually graduating, in the early 1940s, from Sri Pratap College in Srinagar with a Bachelors degree, after which he joined the family carpet business. Life was decent to Rabea and Mehraj. Business thrived. Their children thrived. They lived in luxury and plenty. But then, despite Rabea’s admonitions, Mehraj got involved in the politics of Partition. The end came before they knew it. Actively pro-Pakistan, after the 1947 partition of India and Pakistan, Mehraj became a target for the Indian government and, one night, though no one can remember the exact year, he fled to Pakistani Kashmir. For days he travelled through dense forests where he battled lions and outsmarted djinns, or so it is told, until he arrived in the city of Muzaffarabad. Rabea and her children followed soon after, her youngest child a toddler. They had lost everything, it seemed to Rabea, and in many respects, she never did recover from the loss of her birth land, the life she’d lived there, and the fact that her two eldest daughters, who accompanied her initially, had to eventually return since they were betrothed to Kashmiris settled in Indian Kashmir. 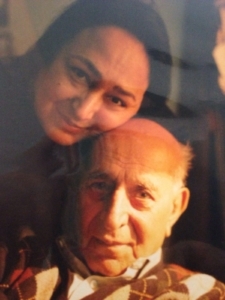 It had never occurred to Rabea and Mehraj that India and Pakistan would perpetually be at war over Kashmir and that they would permanently lose the ability to visit their homeland whenever they pleased, let alone return to live. They lived in Muzaffarabad for a number of years. Mehraj established a carpet business while Rabea looked after home and hearth. Their son and two daughters walked to school through meadows, picking and munching on seasonal fruits, their playgrounds the sparkling, ice-cold Neelam River and the Domeil bridge above it. Then, once again, despite Rabea’s contentions, Mehraj got involved with politics, and though he would go on to become Minister for Information and Commerce, when the administration lost favour, Mehraj also lost office. Weary of partisan politics, Mehraj decided to resettle in the port city of Karachi where he supplied Kashmiri goods to handicraft stores. And so, Rabea once again packed up the home she’d made for herself and travelled, for all intents and purposes, to yet another foreign place. Slowly, Rabea began to settle down in the port city with its palm trees and hot summers tempered by the evening sea breeze. Though Mehraj and Rabea never regained their former prosperity, these were happy days for Rabea. Her children excelled in their studies while her daughters in Kashmir, their own children in tow, began to visit her. She revelled as her grandchildren praised her cooking, and relaxed when the entire family snuggled around Mehraj as he read out loud from Alexander Dumas’ The Count of Monte Cristo, or recited Coleridge: “water, water everywhere/ not a drop to drink”, or regaled them with stories of fiddlers who played on while Rome burned and obedient children who braved flames but did not run because they did not have their father’s permission. Mehraj was progressive in so far as to make sure his son and younger daughters received an equal education, but, although the youngest daughter wanted to be a journalist, Mehraj was adamant they all become doctors. One by one the elder two left for medical college and the youngest one found herself alone and in charge of Rabea’s failing health as well as being her parents’ primary caregiver. It was a role she would decide to honour for the rest of their lives. One day, the daughter received a proposal from a young chartered accountant returned from England. On a visit to an ill relative, he saw her working in the hospital and was smitten by her beauty, as were so many others, and beseeched another relative to make inquiries about who she was and where she lived. And so it was that he arrived at Mehraj’s door with his Uncle, who was the Superintendent of Police, in a forbearing Police jeep, to ask for the young woman’s hand. The young woman had a surfeit of proposals, but Rabea liked the young man’s countenance; he was gentle, she said, and there was great kindness in his eyes, and so she and Mehraj gave their blessings, and so it was that their youngest daughter was married. A year later, a daughter was born to the newly-wed couple; six months later, job opportunities took them to England, and soon after, at their youngest daughter’s behest, Rabea and Mehraj left for England too. I was the first daughter born to my parents. My memories of England are of summer rains and winter suns. Of Abaji fashioning telephones with two paper cups and one long strand of red wool. Moji buttoning my duffel coat, the brown oval buttons fat and slippery in her powder-frail hands. Abaji building me castles of cushions and chairs. Moji’s worried face at the window relaxing only when the bus from Ms Brown’s Nursery arrived at our front door and I stepped down. I would stand in Moji’s coat shoes, beige with chocolate tassels, and, most important, a two inch block heel. She’d follow me, one hand on her bony hip, as I teetered and tottered in front of the budgies’ cage, my arms akimbo, flapping as if I was flying. “You’re ruining her,” my mother said when I broke a heel and Moji merely handed me another pair of high heels. But it was said affectionately, for if anyone was allowed to ruin me, it was Moji. She let me slide down banisters and leap off stairs. She let me make messes of flour and water. She let me overflow the sink. She let me jump from sofa to sofa pretending I was Peter Pan. She let me be destructive and called it constructive. For I was the beloved one. I was the eldest child of her youngest child who had looked after her in sickness and in health, the child of the couple who had given her a permanent address no matter where we lived in the world—London, Jeddah, and finally, Lahore. In Moji’s eyes my family seldom did wrong; no one else got off so easily. She had nicknames for everyone—Zenga Zeet/Long Legs, Thool Kun/Egg Ears, Beeyore Utch/ Cat Eyes, Nastha Vyhut/ Fat Nose—and it upset her that people were full of themselves and duplicitous; she refused to play along. In another time she might have been a wit or a comedienne, except her time had turned her into a nervous woman who found it very hard to trust anyone, an anxious woman who reminisced a lot about the past, a lost woman who could not understand how she had become a refugee, an immigrant, a foreigner, a human who had grown up in one village but was now adrift in the big, strange world. Adrift she may have been, but she was my anchor. In England, when I spied the bald, orange-toga-clad Hare-Rama Hare-Krishna devotees jogging and singing on grey drizzling streets, I was terrified—the monotonous chants, the shorn heads, the orange outfits, all filled me with angst—and I crouched into Moji and she held me tight, urging me to look from beneath her wing. “Beh chus na?” she would say. “Am I not here for you?” She wiped my tears when my white best friend was not allowed to invite me to her birthday party because I was brown. She encouraged me to swim fast and fierce despite the lifeguards whispering how my brown would muddy the pristine pool. “Kanas kash,” she’d instruct me. “Ignore them.” When, every year, I was cast as Joseph in the Christmas Pageant—“Moji, am I Joseph again because I look like a boy?”—she assured me I was a pretty girl. She taught me to cross the road, my fingers laced in hers, looking left to right, right to left, until finally time came to let each finger go. But there were things she could not and would not do in London, or in Jeddah, or in Lahore: switch on the TV or put a tape in the VCR, turn on the tape recorder or plug in an iron, dial a phone, rotary or digital. And as she got older, her helplessness and dependence became less endearing, and adolescent that I was, I began to question her. Why would the evil eye care if we laughed too much? Why would the devil push me over if I stood close to the balcony’s edge? Even if djinns did live in trees, why would they try to enter me only if I walked under the trees at night? Though she’d always been bemused by my questioning, she was not amused at my questioning her and she would eye me sadly, as if she’d always suspected that I too would let her down. I hope she knew how much I loved her. In the last few years of Moji’s life—by then we’d long returned to Lahore—she became sicker and frailer until she was finally bedridden. The scent of sickness—sweet sweat, Dettol, and Cuticura talcum powder—coexisted with acts of love: Abaji wiping her lips with the softest of tissues, my younger sister turning into my mother’s diligent helper, my mother nursing Moji round the clock, giving her sponge baths, monitoring her medicines, spooning broth into her mouth, combing her grey hair into a whisper of a braid, and above all, keeping away bedsores. Moji passed away in her bed in 1992. Death is a shock for those living, no matter how expected or how much of a blessing it is for the patient in pain. Abaji sat with his head in his hands, stunned, tears gushing out of his eyes. I lay with my head in his lap, his words felling me. But she was gone. And my Khalas arrived in Lahore, their presence a balm for Abaji, and for all of us. Moji was buried in the same graveyard as Aunty Mahira’s six-year-old daughter Shazia—a cousin I didn’t know in life, but I was four years old when she passed and her death is literally my first memory—and it seemed a consolation to me that Shazia and Moji were together. The graveyard was a walking distance from our house and for the longest time we went daily to shower their graves with red rose petals, garlands of golden marigolds, prayers, and memories. Gradually, loud mourning for Moji turned into quiet sorrow turned into measured remembrance turned into learning to live with absence turned into living again: the morning prayers, the reading of the Quran and then the newspapers, the walks to Ghalib Market, and the making and drinking of noona chai. In the summer of 1995, Abaji and I found ourselves alone, so to speak, in Watford, a suburb of London. He was visiting his son, my uncle, and staying at his house and I was at the nearby YWCA. We got together daily, me in my silver buckle black boots and Abaji with his walking stick, insisting we go to Watford Town Centre, sit on a bench, and watch humanity pass us by. He watched; I read. He would shake his head when I giggled. And there was always reason to giggle—he called Dracula ‘Dercola’ and spaghetti ‘fergetti’, and insisted that mispronunciation was his prerogative as an old man. Of course when it came to wearing his hearing aid, let alone turning it up, he conveniently forgot he was old and insisted we were the ones with our hearing impaired and that we turn the TV’s volume on full, and when we played pranks on him, turning the volume down yet insisting it was blaring, he’d always eventually laugh. When I went away to college in the US, Abaji sent aerogramme letters written on his typewriter and complained about my standard one line response: Miss you, Abaji. His favourite film was The Guns of Navarone. His favourite meal seemed to be white rice and spicy keema with a glass of milk poured in. Perhaps the milk was to counter heartburn, but I did not think of this then, and instead, supposing it a matter of taste alone, also developed a yen for this odd combination. He told me I had a pretty face, but, “khoran kya goy? What happened to your feet?” He thought they were rather plain and he was most displeased when I said my feet were carbon copies of his. I cajoled him into disclosing his favourite heroine and he shyly admitted to the voluptuous film star Sridevi, and since I too liked Sridevi, we commemorated our mutual like by watching one of her films. He liked my friends. He was the only one who always liked my friends. In my teenage years, I was forever in trouble at home, forever being sent to bed without supper, and there Abaji would be, late at night, knocking at my door, slipping in a full plate, food for my soul. There Abaji was that summer, always smartly dressed in his yolk yellow dress shirt and grey trousers and blazer and walking stick, making some remark or the other as we sat on that Watford Town Centre bench, nodding and smiling at people who passed us by, smiling and nodding in return. And always my heart locks onto one image: my Abaji peering through the glass slit in Uncle’s front door as I saunter down the gravel driveway to return to the YWCA, peering as I step into the street, turn the corner, his forehead knotted with deep concern, in that land-before-cell-phones, that I might not make it back home safe and sound. Abaji passed away five years later in the November of 1997 in Lahore. His heart gave out even though, upon hospitalisation, he was told he was going to be fine. He sat up in the hospital bed to take a sip of milk from my mother’s hand and collapsed. I was in the US. I was not there. Neither were my Khalas. Perhaps Abaji had a premonition, for from the moment he’d stepped into the hospital this time, he repeatedly asked for his daughters in Kashmir. Emergency visas and they might have been able to make it. He especially wanted his eldest daughter, the child who’d been born to him and Moji so soon after they were married, but he desperately wanted to set eyes on his daughters all together one last time. They were not granted visas. Not in time. And finally when the visas came, diplomatic relations between India and Pakistan were so broken, there was no car, no train, no plane travelling between the countries and so, instead of a half-hour flight from Delhi to Lahore, they had to fly in via Dubai. Abaji passed away without seeing them and when my Khalas finally crossed the border, it was in order to see a grave. I also arrived in Pakistan too late for the funeral. My Khalas flew in days after me and I went to pick them from the airport. It was the very first time they did not arrive as late night unexpected surprises delivered to our door in chariots called rickshaws. Instead, there was the long wait at the airport because of delays, and, once they walked out of customs, a sombre reunion. The world changes; change is the world. This was the last time, to date, that I saw my Khalas. It was not the same. Nothing was the same. Moji was gone. Now Abaji was gone. His chair was empty. I will meet, after seventeen years, one of my cousins from the fairytale land. Over the phone I will tell her that my husband is half-Kashmiri, although I always tease him that he’s not Kashmiri at all, that his mother’s family had left Kashmir so long ago that no one in his family could understand Kashmiri, let alone speak it, while I can understand Kashmiri and speak it rudimentarily too. My cousin will chuckle at that. Pourquoi? (I readily accept that a smattering of French does not make me French). I stopped laughing. I will hang up and go about my day, conjuring up menus to dazzle her when she comes for dinner, go about my day and tell my husband how I’ve been renounced by one whose claim is stronger, go about my day getting ready for my night, and, as I will finally lie down to sleep, I will think, it is true, I have never lived in Kashmir, but it is also true that my Kashmir lives in me.